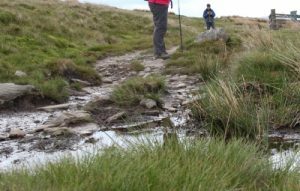 Complying with Natural England’s requirement to undertake an annual survey of each National Trail can prove to be a challenge for the charities and organisations that maintain them. There may be 100s of miles of trails and 1000s of items infrastructure to monitor. Complete end-to-end annual surveys can easily be completed by staff and volunteers using inexpensive Android tablets and the OTISS survey system. Mobile applications are ideal for working with volunteers. They can use the tablets provided or use their own Android phone/tablet to survey allocated sections of the trail. Most of your volunteers will have their own Android/iPhone/iPad and will be familiar with using mobile applications. OTISS stores a set of trail sections/sites and each one has an inventory of infrastructure, path issues and trees. OTISS login accounts are setup for each member of staff from the various organisations involved in the trail. These users typcially have access rights of ‘Admin’ or ‘Manager’ and can use all the facilities on the website and and mobile Path Survey Android app. Additional login accounts are setup for each volunteer that you wish to use OTISS. These users typcially have access rights of ‘Surveyor’. This means that they can only carry out surveys on the specific sections/sites that they have been assigned to. It is important that each individual volunteer has a named account so we can keep an audit trail of their surveys – and gauge whether they are doing a good job. You can provide a set of cheap Android tablets (< £100 each), but many volunteers may be willing to use their own Android phones/tablets. Ruggedised tablets can be over £1500 each – so over the course of 5 years you could afford to drop, lose or break numerous cheap tablets. 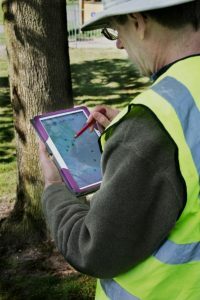 Having a pool of cheap tablets means multiple sections can be surveyed simultaneously and no planning is required to share and pass over tablets. You need to recognise the different levels of familiarity that volunteers have with using smart phones and tablets. Those who have their own Android or iPads will find OTISS easier to use, as they only have to learn how to use the Path Survey app. All volunteers need a couple of hours training in using the Path Survey app and the tablets. A very important part of the training is to explain what to look for during the survey and how to categorise the various conditions they will find. This will ensure greater consistency in the data collected. When running training courses, ensure you have a venue with good wifi speed and an easy way of logging on. Pubs and cafes were generally OK – but do check beforehand that the survey app will work at the venue – sometimes firewalls and security systems can prevent the app from connecting to the OTISS servers. Ideally, those volunteers who have got the hang of it should help by mentoring others through the training and initial surveys. For each trail section/site, a staff user will create an OTISS ‘survey’ and assign the volunteer who has agreed to survey it. This can be done as a once-only survey, or as an ‘authorised’ survey where the volunteer can survey the site multiple times. Provide the volunteer with a tablet – many volunteers are willing to use their own Android phone/tablet. The volunteer uses the Path Survey Android app. 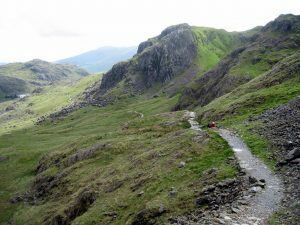 to download the assigned survey – together with previous inspection data and photos for the trail section. Using the Path Survey Android app, they can walk the trail to do the survey. Photos, GPS and references means they can be sure of checking the correct infrastructure item. They create new inspections for each item and can take more photos if they find the condition has significantly altered. New path issues can be created or existing ones updated – with photos. At the end of the day, the volunteer will press the “Close Survey” button to upload all the new inspections and photos to the OTISS server and close the survey. Larger sites can be surveyed in several parts by opening and closing a survey for each day or visit. As soon as the data is sync’ed the ranger can see and check the data on the system. Fairly quick and easy to use, both for the volunteers collecting the data and the rangers viewing it. All staff can view the latest data immediately it is sync’ed. Avoids transcribing of paper records onto an IT system. No data is over-written by the volunteer surveys, instead additional inspection records are added with each survey. This allows historic data to be safeguarded and if someone undertakes a duff or inaccurate survey it can be easily deleted from the system. Volunteer access can be quickly controlled by assigned/de-assigning them from surveys. Achieve more with your volunteers!